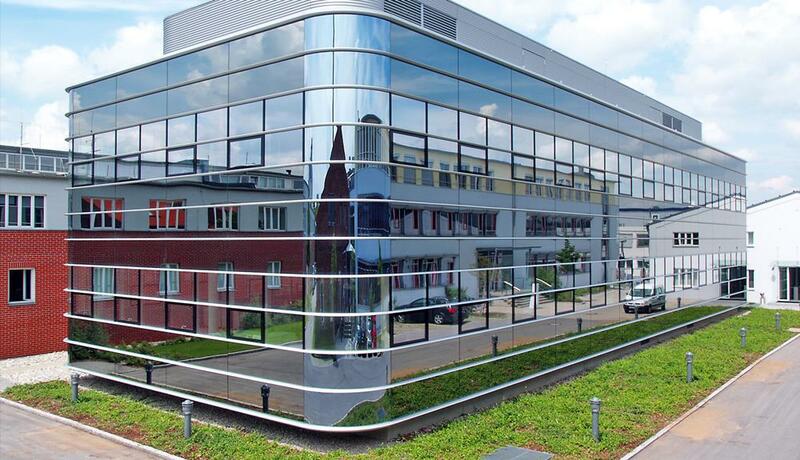 When Germany-based content solution provider PLAZAMEDIA decided to move to new 800m2 premises, it quickly established that IP technology was the only option to deliver the scalable and future-proof media network the company needed in its facilities. In its drive to constantly improve the services it offers to its customers, content solution provider PLAZAMEDIA decided to move to more modern premises in 2018. Ultimately, PLAZAMEDIA wanted to be able to deploy services for its customers faster and more cost-effectively. In its new building, PLAZAMEDIA was particularly keen to transform workflows through infrastructure virtualization, i.e. being able to share studios, control rooms and production resources (e.g. equipment) more easily. PLAZAMEDIA considered the respective benefits using of baseband (SDI) and IP technology in the new building, but concluded that IP was the better option, not least to allow for expansions and expected technical evolutions. The scope of the project was to create an IP media network for both live production and playout. To reduce the risk of issues in production affecting playout, it was decided to create two largely separate, but interconnected networks. That way, should the production network be affected by issues, the playout could still work, and it would still be possible to route external feeds to the playout. One of the objectives of the project was to create greater flexibility in workflows. To achieve this, PLAZAMEDIA came up with the concept of multi-functional rooms (of which there are 17 in the new building), equipped with workstations that used for multiple purposes, e.g. live broadcasting, graphics and sound-tracking. Effectively, this amounts to a virtualization of workflows. This was a multi-vendor project, in which the media network part was a collaboration between PLAZAMEDIA, Nevion, and Nevion’s partner in Germany LOGIC Media Solutions. These 3 companies had previously worked together successfully on an IP remote production production project in 2016. PLAZAMEDIA decided on a software defined network (SDN), based on a spine-leaf network architecture, with 4 Mellanox SN2700 32-port 100Gb switches in the spine and 12 Nevion eMerge 10/40/100G switches as leaves. Nevion Virtuosos are deployed to provide the SDI/IP adaption – as most of PLAZAMEDIA’s equipment and all incoming and outgoing flows are SDI. Virtuosos are also used to provide video processing (frame sync) and audio processing (embedding/de-embedding, delay, and gain). 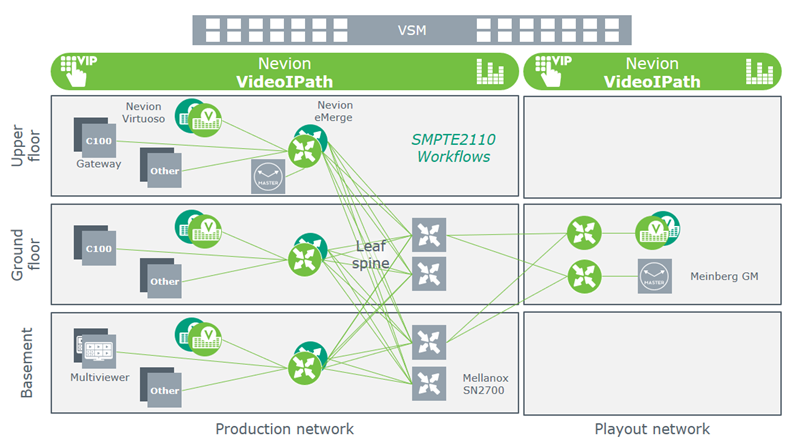 The SDN, with a total capacity of 12.8 TBs, is controlled by Nevion VideoIPath, via control interfaces to both the Mellanox and the Nevion switches. VideoIPath directs the flows from 3,000 potential source(s) to 5,000 potential destination(s), with full protection (SMPTE 2022-7 dual path). It also manages the bandwidth through the network, ensuring that no bottlenecks develop. To ensure familiarity with the old network, VSM is used as the broadcast control interface to VideoIPath. All VSM selections are passed via an Ember+ interface to VideoIPath, which calculates optimal signal paths and configures the network accordingly. In addition to products, Nevion also provided professional services, including media network design, PTP sync distribution design, system integration, project delivery, testing and support. Once PLAZAMEDIA placed the order, it was only 4 months until the solution was live!